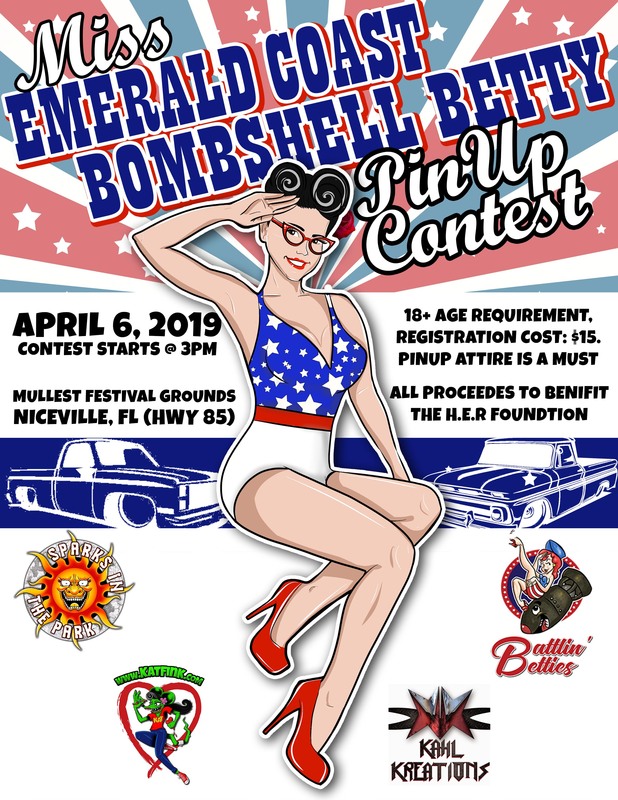 Battlin’ Betties Florida Platoon and Sparks In The Park present the Miss Emerald Coast Bombshell Bettie Pinup Contest! Join us on April 6, 2019 at the Mullet Festival Grounds in Niceville, FL and come flaunt your BEST pinup style. Contest to begin at 3:00PM AFTER a special performance from the Blue Anchor Belles!! Registration fee is $15. Limit of 20 registrants. First come, first served. FREE entry to Car Show with registration. CHECK-IN time is 2pm for all entrants. Entrants are responsible for their own clothing, hair and make up styling. Proceeds will benefit The H.E.R Foundation of Northwest Florida, a nonprofit organization who provides services for homeless female veterans while transitioning into affordable housing. This will include; lodging, meals, access to medical, dental, counseling, job placement, and other social services as needed by the participant. Identifying and providing services to those who are homeless and in danger of becoming homeless.